A vital key to comprehending the brain is to understand how the complex changes in activity occurring at all levels of neural organization give rise to normal brain function. Furthermore, an understanding of normal brain activity will allow us to investigate abnormalities of neural dynamics that underlie many neurological and psychiatric disorders (e.g. epilepsy, Parkinson’s disease, schizophrenia). 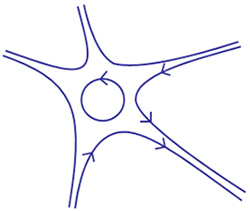 Understanding neural dynamics requires interdisciplinary approaches that span many neuroscience areas, but crucially, also depends on the integration of experimental and clinical approaches with mathematical and computational expertise. This PhD programme trains a future generation of neuroscientists to successfully combine experimental and theoretical techniques in their research. First year: students attend taught courses to gain an understanding of the biology of the nervous system and the ability to describe systems dynamics in mathematical models. Students carry out two extended research projects, each investigating dynamics in a different neural system. Each project is co-advised by one experimental or clinical neuroscientist and one mathematician or computer scientist. Subsequent years: Students develop one of the initial projects into a PhD project for the remaining 3 years. Applicants will have a 1st class/2.1 degree or a Masters in a biomedical science discipline or a relevant theoretical discipline (mathematics, computer science or physics). Crucially, we are looking for talented and motivated students willing to take up the many challenges in neural dynamics and who are open to learning about new disciplines and working across different fields. Bristol has one of the largest concentrations of neuroscientists in Europe and is a major centre for basic and clinical neuroscience. The University of Bristol is an acknowledged world leader in many key areas of neural dynamics from both an experimental and theoretical perspective: Our research spans molecular, cellular and systems levels of neuroscience. Together with experts in systems dynamics, based in the Departments of Engineering Mathematics, Mathematics, Computer Science and the Bristol Robotics Lab we can provide considerable scope for ground breaking integrative research projects. Please ensure you include a CV, and two referees plus a cover letter outlining your own neuroscience interests by Sunday 6 January 2019. Please upload your covering letter into the Personal Statement section of the application form. Interviews will be conducted in the week beginning 21 January 2019. The Wellcome Trust provides a stipend and PhD registration fees at UK/EU student rate, research expenses, contribution towards travel and a contribution towards transferable-skills training. The Wellcome Trust does not pay fees at the overseas rate but we are able to waive overseas fees for one overseas student.